Image Caption: Although most regard the National Rifle Association (NRA) as relevant and influential to domestic U.S. politics, the organization may in fact threaten the reputation of the United States as an international moral authority. On March 5th, 2018, a threatening video made headlines throughout the United States and gained international attention. With Wild West music playing in the background, a woman wearing all black sits in a dark room with an hour glass. After listing enemies of “individual liberty in America,” including the New York Times and Washington Post, she flips the hour glass and warns, “Your time is running out.” The woman featured in the video was Dana Loesch, official spokesperson for the National Rifle Association. The video was released in response to highly publicized calls for gun control from American students. This movement emerged in wake of a horrific mass shooting at Marjory Stoneman Douglas High School in Florida. Ms. Loesch’s combative tone and threatening words perfectly illustrate the longstanding reality of the NRA as a radical non-state actor that aggressively influences America’s gun control debate. Gun control remains one of the most polarizing issues in American politics. This public and political debate is primarily focused on the potential for Congress to take modest action in order to reduce gun violence. It has gained significant attention in recent years, considering the number of high profile, and deadly, mass shootings. Advocates of gun control point to measures such as banning semi-automatic rifles and increasing background checks for firearms purchases. While they push for restrictions on gun ownership (for mentally ill people, wanted terrorists, etc. ), they usually refrain from opposing the fundamental right to bear arms. This paper analyzes the NRA as a controversial non-state actor in the context of the gun control debate within the United States. It first provides background information on the organization, then proceeds to emphasize the sources of its influence in American politics and society. It contends that the group is a remarkably powerful actor that serves as a leading obstacle to gun control legislation in the US. The paper subsequently considers the potential for the NRA to have consequences for the US beyond the domestic realm. It specifically argues that due to its prominent role as the leading opponent to any form of gun control, the NRA serves as a threat to American soft power, broadly defined as the ability to exert international influence through attraction as opposed to coercion. In this light, the NRA is not only indirectly killing Americans through its role in opposing gun control, but also killing America’s influence as an effective democracy, ‘city on a hill,’ and symbol of progress around the world. The NRA proudly describes itself as “America’s longest-standing civil rights organization.” According to their official website, members are “proud defenders of history’s patriots and diligent protectors of the Second Amendment.” With roughly five million members and revenues exceeding 200 million dollars annually, the non-state actor is well known for lobbying against gun control not only in Congress, but also in state legislatures and local counties. This crucial work is primarily carried out through the NRA Institute for Legislative Action and the Political Victory Fund. It is important to note, however, that the association is involved in a much wider variety of activities, ranging from firearm training programs to producing its own television station. In contemporary American society, particularly among Democrats, the NRA is often associated with an extreme glorification of the Second Amendment and is viewed as an uncompromising force against any form of gun control. When mass shootings trigger debates about the need to regulate automatic weapons, for example, the NRA responds to counter the movement. The group embraces the slippery slope logic, essentially contending that any form of gun control is the first step in a government plan to confiscate all guns and restrain individual liberty. One of their most famous arguments against gun control, “the only thing that stops a bad guy with a gun is a good guy with a gun,” ironically calls for more firearms in order to address gun violence. Another well-known talking point, “guns don’t kill people, people kill people,” attempts to shift blame away from guns, and towards “monsters” and “lunatics.” Vice Executive President Wayne LaPierre has claimed that dangerous, crazy people are roaming the streets, and believes that all Americans deserve the right to defend themselves using whatever firearm they chose. Founded in 1871, the NRA was simply a recreational group whose objective was to “promote and encourage rifle shooting on a scientific basis.” For much of its history, the organization was largely indifferent to political advocates of second amendment rights. The group even officially supported gun control laws in 1934 and as recently as 1968. Nevertheless, the NRA became increasingly political in the 1970s, institutionalizing lobbying efforts and moving towards their current position as absolute defenders of the second amendment. At present, it would be impossible to have any political discussion regarding guns in America without confronting this increasingly ubiquitous, vocal, and relentless pro-gun organization. in recent years, laws remain unchanged. Notwithstanding widespread public support for minor reforms (such as universal background checks), Congress consistently fails to act. This political environment sheds light on the power of the NRA. Despite statistical evidence linking the number of guns in America to significant rates of violence, and widespread public support for reform, any sort of legislative change remains out of reach. To be clear, the NRA is not the only reason why gun control remains unthinkable in Congress. First of all, it is part of a wider gun lobby. Secondly, factors that include a highly partisan political climate as well as historically ingrained pro-gun values among many lawmakers have also influenced the debate independently of the NRA. Nevertheless, it is well documented that the NRA is the single most powerful component of the gun lobby and that it has played the leading role over the past several decades in blocking measures that would have controlled or restricted the sale or use of firearms in the US. As the upcoming section will illustrate, it has done so through its ability to raise money, lobby, create a pro-gun culture, and mobilize supporters. In a surprisingly explicit illustration of NRA influence, Senate Majority Leader Mitch McConnell told reporters in 2016 that he “couldn’t imagine” his Republican-controlled Senate confirming any Supreme Court nominee who lacked the support of the NRA. His comment reveals the pervasive influence of the organization, not to mention the deepening politicization of the Supreme Court by an increasingly partisan Senate, which appears to take its cue from this omnipresent lobby group. Beyond efforts to block gun control, the group appears to be a consistent political consideration for Senators, even when considering appointments for the highest judicial office in the land. This type of influence is hardly surprising considering the increased political involvement of the NRA in recent decades. For example, research has connected NRA advocacy to the Republican takeover of the House of Representatives in 1994. With a Republican back in the White House in 2000, the group supported two major pieces of pro-gun legislation that were adopted by the Bush administration. In the 2004 national elections, the Director of the NRA Institute for Legislative Action boasted about the group’s 6.5 million endorsement postcards and letters, 2.4 million endorsement phone calls, and 28,000 television advertisements. Campaign donations, overwhelmingly directed to Republicans, have served as a critical tool. In the 2016 elections, Republican Speaker Paul Ryan received over $170,000 from the group. Even at the state level, the NRA recently funneled over $400,000 to its chosen candidates in Colorado in order to defeat two incumbent Senators who had supported minor gun control policies including universal background checks. At the Presidential level, the NRA became the second highest funder of advertisements for Donald Trump, and contributed thirty million dollars to his campaign overall. LaPierre and his team spent millions more helping win five key Senate races in 2016. The NRA outspends all other gun-related organizations when it comes to supporting or opposing candidates. Beyond the campaign trail, it also serves as a significant political force for elected officials to contend with. This was illustrated by the rapid mobilization of lobbyists to the Connecticut State Legislature to counter gun control efforts following the slaughter of 20 children at Sandy Hook Elementary School. Ultimately, it is clear that broad public support for moderate gun control remains frustratingly ineffective in the face of the NRA’s financial influence, aggressive advocacy, and ubiquitous political capital. However, the contribution of the NRA to the lack of gun control in America goes beyond direct political activity. In a recent article, Bill Scher convincingly argues that the NRA “has built a movement that has convinced its followers that gun ownership is a way of life, central to one’s freedom and safety, that must be defended on a daily basis.” He contends that this cultural influence is the primary source of the NRA’s political power. Numerous other scholars and commentators have similarly claimed that the NRA thrives on creating a culture of fear. In order to promote the rights of citizens to own firearms with as few restrictions as possible, the association attempts to appeal to the public through various warnings that emphasize the necessity of their second-amendment rights. As the Economist noted in 2013, the group provides an “alternative narrative about America as an exceptionally violent dystopia,” featuring dangerous individuals who liberals allow to roam free. Following this logic, the NRA publically argues that “good citizens need semi-automatics” to defend themselves from potential threats. LaPierre made this idea clear in 2012, arguing that arming ‘good guys’ at schools was, “the only way to stop a monster from killing our kids.” Considering the fact that two-thirds of American gun owners list protection as a main reason for possessing a firearm, this culture of fear appears to have a receptive audience. Not only does the NRA warn the public about ‘bad guys with guns,’ but also about politicians in Washington, who allegedly want to prohibit citizens from defending themselves. In this light, the culture of fear is amplified by portrayals of an intrusive federal government that threatens individual freedom. In an explicit and inaccurate claim, the NRA warned “Obama will take our guns.” This narrative has proved appealing to certain Americans, especially in the context of broader conservative culture, and has therefore provided the NRA with a high degree of grassroots support and popular legitimacy. Sociologist Scott Melzer has highlighted how this culture of individual freedom resonates particularly well with a core base of NRA supporters- older conservative white men, who believe that government should refrain from intruding in their lives. Considering the normative power of the Second Amendment, and the historical American narrative that the Federal government has the potential to inappropriately infringe on individual liberty, the NRA finds listening ears among many of America’s conservatives. In fact, Pew Research Centre has found that nearly 75% of gun owners believe that the right to bear arms is “essential to their sense of personal freedom.” Certain scholars have persuasively connected the NRA’s popular appeal and successful grassroots mobilization to neoliberal ideals that have dominated American society since the 1980s. They specifically relate the gun control debate to negative perceptions of government intervention, and highlight how “rugged individualism” is positively associated with “virtue and responsibility,” according to neoliberal thinking. In this context, the NRA has become part of the broader conservative movement in the US, one that prioritizes individualism over interventionist liberal ideas ranging from universal health care to progressive taxation. Pointing to NRA coverage of non-traditional issues such as immigration, University of California Professor Adam Winkler argues that “We’re seeing the NRA become an extreme right-wing media outlet, not just a protector of guns.” Through association with a larger political ideology, one that is rooted in the core national value of individual liberty and that is championed by the Republican Party, the NRA has clearly developed a degree of normative political power that helps its pro-gun message resonate with those on the American right. In summary, the NRA has attempted to foster a pro-gun culture in the US, telling citizens to fear dangerous monsters with guns, as well as Washington liberals who allegedly want to strip them of their second amendment rights. It has done so through its public statements, television network, national magazine, annual national meeting, and media spokespeople, among other avenues. The essential point to note, however, is that this culture has facilitated the political mobilization of followers. By appealing to certain Americans’ fears and their love for individual liberty, the NRA can subsequently influence politics through its members and supporters. Through voting information packages, ratings of candidates, and endorsements, the NRA effectively encourages civic participation. Noting this influence, Melzer has claimed that the NRA’s powerful lobbying status is “a reflection of the group’s influence at the polls,” and that its “big stick” is members who base voting on the issue of guns. Negatively incorporating Democrats into their culture of fear, the NRA consistently calls on Americans to engage in political action at the local, state, and national level. Considering the fact that 46% of NRA gun owners “have contacted a public official to express their opinion on gun policy,” their mobilization strategy appears effective. Examining data since the 1970s, researchers have found that “gun owners are developing a power political identity” that is increasingly associated with predictable voting behavior. In this context, it appears as though there is always an inspired group of citizens for the NRA to stir up. Is the NRA Really That Powerful? Critics seeking to downplay the power of the NRA will likely argue that the group simply acts on behalf of Americans who have always valued the second amendment, or that its campaign contributions remain relatively modest. What remains clear, however, is that the NRA has served as the most prominent, organized, and holistic actor speaking on behalf of gun rights. 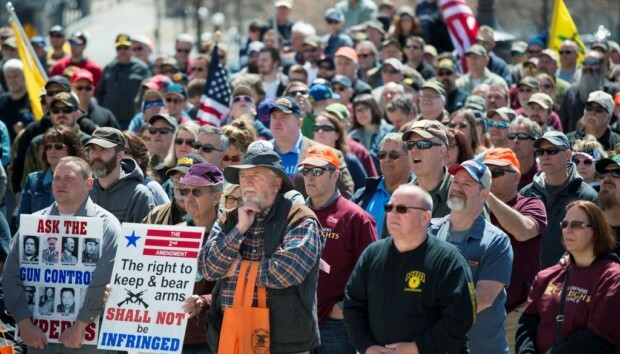 Perhaps they repeat a pro-gun message that numerous conservative citizens and politicians already agree with, but they consistently make that message loud, clear, and uncompromising. Gun violence in America is the worst among any developed nation. With almost as many guns in the country as people, the country has the most firearms per population in the world. Whether its related to gangs in inner cities, domestic violence at home, or mass murder at schools and churches, gun violence has touched countless lives in America and has consistently raised questions about legislative reforms. It is in this context that the NRA should be viewed as an extremely influential non-state actor that has been a key player in preventing any sort of gun control measures. Through funding campaigns, lobbying in Congress, supporting a culture of fear, and appealing to proponents of individual liberty, the NRA supports a political agenda where major gun control is inconceivable, even in wake of tragedies. The term ‘soft power’ (also referred to as co-optive power) was famously coined by Joseph Nye nearly three decades ago. In an international environment featuring economic interdependence, new technologies, an increase in transnational actors, and new cross-border challenges ranging from climate change to global health, this Harvard professor explained how power might be more complex than a country’s military arsenal or gross domestic product. Soft power, Nye says, means “getting others to want what you want” when it comes to foreign policy. Whereas hard power involves the use of strong-arm tools such as military might in order to achieve a foreign policy goal, soft power relies on attraction and/or non-coercive persuasion. Using soft power resources including culture, political values, and foreign policies, states can influence foreign opinions in order to make their own foreign policy objectives attractive to strategic targets. This allows states to work towards their goals in a more legitimate and less contested manner. It is essential to note, however, that soft power is dependent on the perception of qualities including competence as well as beauty. Beauty refers to the credibility and legitimacy that an actor is granted as a result of living up to its self-proclaimed values and ideals. While the US has evidently led the world in terms of hard power resources since the second half of the 21st century, it has also been an effective utilizer of soft power. It is important to note that historic national identity has played a major role in this area. Many Americans have viewed their country as an effective democratic experiment, “city on a hill,” champion of individual liberty, and symbol of progress around the world. This was especially important during the Cold War, when the promotion of American culture and political values helped support the strategic goal of increasing the attractiveness of the US system vis à vis the communist Soviet Union. Through radio broadcasts, touring jazz groups, the promotion of human rights, academic exchanges, and other public diplomacy tools, American soft power contributed to destabilization of the Soviet Union, and to ultimate victory in the Cold War. In more recent decades, the US has continued to use soft power in order to facilitate its international agenda and to legitimize its position as the world’s major superpower. For example, in speeches aiming to reach out to the ‘Muslim world,’ President Obama stated that US interests are “essential to peoples’ hopes,” and that the country “has been one of the greatest sources of progress that the world has ever known.” Framing the US as a champion of freedom and a leader for global stability, Obama aimed to increase the attractiveness of his country in regions where anti-American sentiment threatened national security. More generally, the Obama administration evidently demonstrated the US desire to be viewed as a moral international actor whose leadership is essential for international prosperity and progress. An obvious example was a 2013 speech by Secretary of State Hilary Clinton in Geneva. Asking countries to join the US on “the right side of history,” she boldly proclaimed that “gay rights are human rights and human rights are gay rights.” Following this logic, the US serves as a model for the world through progressive ideas of human rights. After all, half a century earlier, national security officials argued that the American value of freedom was “the most contagious idea in history.” Combining this moral authority with unprecedented economic prosperity, popular culture, and its historical narrative as a former colony that transformed itself into a world power, it is no surprise that American leaders have viewed their country as a noble international leader for others to follow. These leaders have understood the coercive power at their disposal, but have not forgotten their unique attractive power. This section examines how international perceptions of under regulated and seemingly out of control gun violence in America, threatens the country’s attractive power as a safe land of opportunity, respecter of human rights, and symbol of progress. It is essential to note that international coverage of mass shootings plays a primary role in informing foreign publics about American gun issues and therefore in creating negative perceptions of American society. Mass murder of innocent students from Columbine to Parkland has left no shortage of media coverage sparking shock, fear, and fierce debates over the normalcy of firearms in American society. This section specifically illustrates how the NRA contributes to problems of legitimacy for American soft power in two ways. First and foremost, in light of negative international perceptions of gun violence, the NRA indirectly contributes to deteriorating American soft power through its role as the primary non-state actor fighting in the anti-gun control arena. Secondly, the international reputation of the NRA itself risks negatively portraying ordinary American citizens as radical gun-lovers and its democracy as compromised by special interests. In 2013, British journalist Jonathan Freeland clearly articulated the potential for gun violence to harm America’s international reputation. Writing for The Guardian, he points out that America appears “incapable of protecting the lives of innocent Americans at home,” and argues that gun violence “makes the country seem less like a model and more like a basket case.” Freeland goes on to claim that every time foreigners hear about Americans killing each other with automatic weapons, “the power of America’s example fades a little more.” Considering the fact that research has shown foreigners to perceive Americans as violent, Freeland’s argument certainly carries weight. Additionally, the fact that gun-related homicide rates are roughly 19 times higher in the US than in 23 other ‘high income’ countries further illustrates problems for the American reputation as a free and safe society where everyone can pursue opportunity while enjoying fundamental rights. As previously explained, soft power legitimacy depends on beauty, or how well an actor relates to its ideals. When American citizens lose their lives in schools and movie theatres, it undoubtedly becomes harder for America to convincingly champion human rights and the importance of individual freedom to pursue one’s dreams. By fighting against common-sense gun control measures that would almost certainly reduce deadly shootings (such as increased background checks, banning automatic weapons, and preventing wanted terrorists from purchasing firearms) the NRA is indirectly buttressing the negative unfavorable international perception of American society. In doing so, it makes it harder for America to exercise co-optive influence in the world. Gun violence risks decreasing the attractive power of the US among foreign publics, even American allies. While there doesn’t appear to be significant research on foreign perceptions of gun violence in America, anecdotal evidence from the media provides important insights on the danger concerning soft power erosion. In the United Kingdom, the media has frequently portrayed mass shootings in America as a reflection of “too many guns,” an incomprehensible gun culture, and consistent tragedy. Following the Charleston church shooting in 2015, the front page of The Independent tellingly read, “America’s Shame.” Similarly, a researcher at the University of Sydney has stated that Australians “don’t understand America’s need for guns,” and that the strong pro-gun culture is mystifying for those outside of the country. Following the most recent mass shooting in Parkland, a Canadian columnist and political strategist wrote that Canadians feel a degree of “smugness” when mass shootings expose the horrific violence that differentiates the United States from its northern neighbor. He even points to a recent poll illustrating that “gun control constitutes one of the biggest differences between Canada and the US,” according to roughly 66% of Canadians. Ultimately, the US has a unique pro-gun society and history that few in other countries can understand. News of mass shootings have reached increasingly larger international audiences, especially as the two deadliest incidents in American history have taken place within the past two years. Considering this media landscape, as well as the fact that America has frequently been criticized for hypocrisy regarding human rights, strong potential exists for gun violence to further erode American influence as a safe and prosperous country with a mission of world leadership. In this regard, the NRA’s counter intuitive message of less gun control and more armed civilians is likely to hinder America’s image in the international arena. One notable example of academic research on the issue of gun violence and attractive power comes from Australia. Examining American tourist advertisements targeting Australians in 2013, researchers found that numerous respondents mentioned guns in the context of the US, and that the positive tourism commercial could not easily counter perceptions of America as a violent place. The results indicate that views toward gun violence had the potential to negatively impact the success of tourism campaigns, as well as “general attitudes towards the US government.” The article concludes by claiming that public diplomacy (a key component of soft power) was one reason to “re-think US gun laws.” In other words, regulating firearms to decrease violence could help improve the international image of America. This idea clearly sheds light on the role of the NRA as not simply an opponent of gun control, but also as a voice whose policy agenda undermines America’s international status. The incredulous reaction of other major powers to mass shootings provides further tangible evidence confirming that gun violence undermines US soft power. As the Washington Post reported following a mass shooting at a navy base, the Kremlin intended to take advantage of the incident in order to attack the attractive power of America. A senior Russian foreign affairs official ironically tweeted that the tragedy was “clear confirmation of American exceptionalism.” Diplomats at the American Embassy clearly noticed this attempt to attack their country’s image, tweeting back “Why use a tragedy to score political points?” Russia isn’t the only rival power that has pointed to gun violence in order to challenge the normative power of America. In a 2016 report discussing human rights in the US, China’s Foreign Ministry stated that gunshots were “lingering in people’s ears behind the Statue of Liberty.” The report contends that the US has demonstrated hypocrisy when it comes to human rights, and mentions gun violence in the very first section, titled “Serious Infringements on Right to Life, Personal Security.” This message has also appeared in Chinese media. In 2018, a Global Times article called the US “inhumane,” and claimed that there is an “urgent need for the US to impose harsh restrictions on gun purchases.” It subsequently argued that the country can “learn from China and genuinely protect human rights.” While these statements have not explicitly mentioned the NRA by name, it is practically impossible to discuss gun violence in America without considering the radical non-state actor that advocates absolute gun-rights over any sort of gun reforms aimed at public safety. In a contemporary environment where American leadership appears to be fading, this issue of minimal gun regulations facilitating mass murder certainly appeals to governments anxious to increase their own attractive power relative to the US. Finally, one should consider the potential for American guns to be used by actors outside of the country. This issue risks exacerbating negative foreign attitudes towards American’s lax gun policy and, thus, to a further decline in its soft power. For example, a recent article by Chelsea Parsons of the Centre for American Progress is titled, “American guns are killing our neighbors in Canada and Mexico.” Highlighting how 98% of the guns used in Canadian crimes originate from the US (and 70% for Mexico), she argues that America’s moral standing may be delegitimized if its own “inaction on gun violence redounds to the detriment of the safety and security of our international community.” Additionally, terrorist organizations such as Al Qaeda have urged followers to take advantage of America’s abundance of “easily obtainable firearms.” In this light, not only are Americans killing each other, but their guns risk being used for violent crimes transnationally. Can America ever be a safe, secure and attractive country if the terrorists that it strives to defeat can readily purchase assault weapons within the country? Once again, on the surface, the NRA’s role in undermining American soft power may appear nebulous. However, the fact is that the NRA’s uncompromisingly extreme laissez faire approach to this issue has facilitated the abundance of American guns, and in turn the opportunity for those guns to be obtained by criminals and terrorists in other countries. As described earlier in the paper, the NRA’s relentless and multifaceted promotion of pro-gun culture along with its richly funded direct political advocacy, has played an indispensable role in the maintenance of an American society lacking effective and widespread gun control regulations. While the paper has emphasized the indirect impact of the NRA on American soft power, it now briefly turns to consider the potential for the organization to have a more direct effect. It is essential to note that the NRA is known outside of America. In addition to general gun violence, the international reputation of the NRA itself risks negatively portraying sensible and effective American governance as hampered by an extremist non-state actor. In a recent video explaining the issue of gun violence in America, Le Monde described the NRA as the primary reason for the lack of gun control in America, and claimed that the group was controlled by “a radical fringe.” For the world at large, the US is unlikely to be celebrated as the inspirational democracy that it claims to be if the gun lobby is viewed as having control of a majority of its politicians and in turn the government’s ability to implement basic and broadly supported public safety measures. In 2016, the British Broadcasting Corporation turned its attention to the NRA when it published an article exploring its powerful influence on America’s gun control debate. By highlighting the group’s “disputed interpretation of the Second Amendment,” the BBC underlined its skepticism regarding the NRA’s political position. In international and US media, the NRA is frequently portrayed as an extreme and non-empathetic group that buys politicians and aggressively promotes an unconstrained, pro-gun culture throughout the country. Outlandish claims and insensitive statements often reinforce this perception. In response to the recent “March for Our Lives” protest, for example, the group claimed that student protestors were “manipulated by gun-hating billionaires and Hollywood elites” in their effort to “destroy the Second Amendment.” This type of exaggerated, paranoia-driven claim is likely to further depict the NRA as a radical organization that lowers the quality of political debates regarding gun control. Furthermore, the NRA has been associated with support for President Trump in recent years. This is likely to further damage its international reputation, considering negative views of Trump around the world and the concomitant decline in American attractiveness. In a political environment where frequent mass shootings spark increasingly strong calls for gun control, the NRA may appear to be an organization on the defensive. However, this paper has illustrated the significant power of the non-state actor in the American political sphere. Not only does it control the gun-control debate by engaging in campaign financing and lobbying, but also by promoting an extreme pro-gun ideology throughout American society. Ultimately, however, the paper sheds light on the NRA as a domestically focused non-state actor with international implications for the United States. Its ability to limit gun control, combined with the association’s generally unfavorable international reputation, represents a troubling obstacle to those policymakers seeking to enhance and legitimize American soft power. If the US wants to use attraction to get others to follow its lead in foreign affairs, then it must address some tough questions: Can you be a champion of human rights if you can’t protect the basic safety of children in your schools? Can you be a legitimate and effective representative democracy if the NRA appears more influential than public opinion when it comes to gun control? Can Americans be viewed in a positive light if the rest of the world view them as irrational gun-obsessed fanatics who believe they have a God-given right to own automatic assault weapons? The NRA is central to these questions and must be recognized as a significant obstacle to America’s desire to wield international influence through the power of attraction. Nevertheless, the organization should be viewed within a broader context when considering America’s ongoing ability to be a leading and effective actor in the application of soft power. For example, there are increasing questions about America’s ability to effectively use soft power to influence world affairs as a direct consequence of the election of its current President. Many view the new President as not only unqualified for the office, but disturbingly disengaged in the international arena and openly contemptuous of international organizations, relationships and cooperation. While the NRA may appear to be a single-issue non-state actor in domestic politics, scholars of international relations must assess its role in this broader context in order to fully understand challenges impacting American soft power moving forward. Darcy Taylor is a fourth-year student at the University of Toronto as a Redknee Loran Scholar. He specializes in International Relations with a focus in International Law and Human Rights. A former Intern in United States Congress, Darcy has research interests surrounding American foreign policy and soft power. See, for example, Alina Polianskaya, “NRA issues threatening video warning journalists ‘your time is running out’,” The Independent, March 5, 2018. https://www.independent.co.uk/news/world/americas/nra-video-threatens-journalists-gun-laws-us-florida-shooting-twitter-dana-loesch-a8240341.html ; Nicole Gaudiano, “NRA spokeswoman warns media, Hollywood and athletes ‘time is running out’,” USA Today, March 5, 2018. For more on the gun control debate in recent years, see, Sabrina Siddiqui, “’Shameful day in Washington’: five years after gun reform failed, is change coming?” The Guardian, April 17th, 2018. https://www.theguardian.com/us-news/2018/apr/17/us-gun-control-sandy-hook-five-years-later ; Michael Jones and George Stone, “The U.S. Gun-Control Paradox: Gun Buyer Response to Congressional Gun-Control Initiatives,” Journal of Business & Economics Research (Online) 13:4 (2015), 167-168. Joseph S. Nye, Jr, “Soft Power,” Foreign Policy, No. 80, Twentieth Anniversary (Autumn, 1990), 166-168. For membership numbers, see NRA official website; for revenue, see Jones and Stone, “The U.S. Gun-Control Paradox,” 168. Scott Melzer, Gun Crusaders: The NRA’S Culture War (New York: New York University Press, 2009), 225. Jones and Stone, “The U.S. Gun-Control Paradox,” 168. Chad Kautzer, “Good Guys with Guns: From Popular Sovereignty to Self-Defensive Subjectivity,” Law Critique 26 (2015), 176. Robert Richards, “The Role of Interest Groups and Group Interests on Gun Legislation in the U.S. House”, Social Science Quarterly 98:2 (2017), 471; The Economist, “The curious strength of the NRA,” March 16th, 2013. https://www.economist.com/news/united-states/21573545-americas-gun-lobby-beating-back-post-newtown-push-gun-controls-curious. Richards, “The Role of Interest Groups and Group Interests on Gun Legislation in the U.S. House,” 471. See, for example, Gun Owners of America (https://gunowners.org/), National Association for Gun Rights (https://nationalgunrights.org/). See for example, Jones and Stone, 168. Ibid., 230. Note this was in 2013. Jones and Stone, “The U.S. Gun-Control Paradox,” 169-170. Jones and Stone, “The U.S. Gun-Control Paradox,” 169. The Economist, “The curious strength of the NRA,”; Luigi Esposito and Laura Finley, “Beyond Gun Control: Examining Neoliberalism, Pro-Gun Politics and Gun Violence in the United States,” Theory in Action 7:2 (2014), 91. The Economist, “The curious strength of the NRA,” note LaPierre remarks post Newtown. Esposito and Finley, “Beyond Gun Control: Examining Neoliberalism, Pro-Gun Politics and Gun Violence in the United States,” 82. Melzer, 2; Brown and Igielnik, “Key takeaways on Americans’ views of guns and gun ownership,” Pew Research Center, note white men are actually twice as likely to own a gun than white woman as well as nonwhite men. Brown and Igielnik, “Key takeaways on Americans’ views of guns and gun ownership,” Pew Research Center. Esposito and Finley, “Beyond Gun Control: Examining Neoliberalism, Pro-Gun Politics and Gun Violence in the United States,” 76-80. See, Mark Joslyn, Donald Haider-Markel, Michael Baggs, and Andrew Bilbo, “Emerging Political Identities? Gun Ownership and Voting in Presidential Elections,” Social Science Quarterly 98:2 (2017). See, for example, Richards, “The Role of Interest Groups and Group Interests on Gun Legislation in the U.S. House,”471-472. See, Joseph S. Nye, Jr, “Soft Power,” Foreign Policy, No. 80, Twentieth Anniversary (Autumn, 1990), 153 – 171. Joseph Nye, “Soft Power and American Foreign Policy,” Political Science Quarterly 119:2 (Summer, 2004) 256, 266. Alexander L. Vuving, “How Soft Power Works,” Paper presented at the panel “Soft Power and Smart Power,” (Toronto: American Political Science Association Annual Meeting, 2009), 11. See, for example, President Truman claiming that “the free people of the world” were depending on America to support them in the early Cold War. President Harry S. Truman, “Address before a Joint Session of Congress,” (March 12, 1947), quoted in Dennis Merrill and Thomas Paterson, Major Problems in American Foreign Relations, vol. II (Wadsworth: Cengage Learning, 2009), 200 – 202. Also, Ronald Reagan, “Election Eve Address “A Vision for America”,” November 3, 1980. Online by Gerhard Peters and John T. Woolley, The American Presidency Project. http://www.presidency.ucsb.edu/ws/?pid=85199. Secretary of State Hillary Clinton, “Remarks on LGBT Rights,” Palais des Nations, Geneva, December 6, 2011, Permanent Mission of the United States of America to the United Nations and Other International Organizations in Geneva. https://geneva.usmission.gov/2011/12/06/free-and-equal/. See, Jami Fullerton and Alice Kendrick, “Perceptions of Gun Violence in the US as a Moderator of International Tourism Advertising Effectiveness,” Place Branding and Public Diplomacy 11:2 (2015), 103. Jones and Stone, “The U.S. Gun-Control Paradox,” 167. Ibid. Note Senator Feinstein’s gun control proposal regarding the terrorist watch list. Melzer, Scott. Gun Crusaders: The NRA’S Culture War. New York: New York University Press, 2009. Merrill, Dennis and Thomas Paterson. Major Problems in American Foreign Relations, vol. II. Wadsworth: Cengage Learning, 2009. President Barack Obama: “Remarks in Cairo.” June 4, 2009. Online by Gerhard Peters and John T. Woolley. The American Presidency Project. http://www.presidency.ucsb.edu/ws/?pid=86221. President Ronald Reagan. “Election Eve Address: A Vision for America.” November 3, 1980. Online by Gerhard Peters and John T. Woolley. The American Presidency Project. http://www.presidency.ucsb.edu/ws/?pid=85199. Secretary of State Hillary Clinton. “Remarks on LGBT Rights.” Palais des Nations, Geneva, December 6, 2011. Permanent Mission of the United States of America to the United Nations and Other International Organizations in Geneva. https://geneva.usmission.gov/2011/12/06/free-and-equal/. The Economist. “The curious strength of the NRA.” March 16th, 2013. https://www.economist.com/news/united-states/21573545-americas-gun-lobby-beating-back-post-newtown-push-gun-controls-curious.